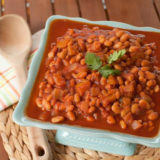 Tangy, saucy, and savory-sweet, these easy Crock Pot beans practically scream “summer barbecue!” They’re one of those happy sides that’s perfect for all, but they also just happen to be vegan. Score! We pulled the plug on cable about three years ago, and aside from occasionally missing football, HGTV, and the Oscars, we’re still cool with our decision. It helped break us of the “background TV” habit, though I still have to say that with the Roku streaming Netflix, HuluPlus, and Amazon, we still manage to watch way too much TV. Especially these last couple of weeks. Because once I discovered that Fixer Upper was available on Amazon, let’s just say I’ve made up for all that lost HGTV time. By binging on a home improvement show. Livin’ the scintillating dream, that’s me! Anyway, Chip and Joanna have convinced me to move our kitchen remodeling project to the top of our home project list. Knock out this wall here, extend that island there, bust out that backsplash, paint the cabinets. No problem! My guy mostly just listens and smiles – vaguely – when I talk about it. I can’t decide if that means he’s on board or not. 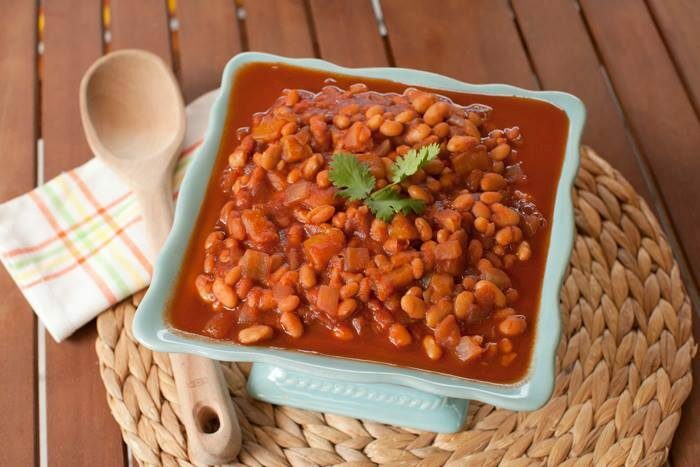 Meanwhile – light, white, open kitchen or not – these Slow Cooker Mango BBQ Vegan Baked Beans are going to be happening in there. A lot. They’re so so so perfect for summer. I just can’t help but tout, over and over, how wonderful the Crock Pot is for summer cooking. You do all the work in the morning, before the weather turns sweltering. And then the Crock Pot just sits there nicely, doing its thing all day without transforming your kitchen into a sweat box. Crock Pots are perfect for toting to barbecues, too. Plus, they keep the goods warm until nosh time. Win. 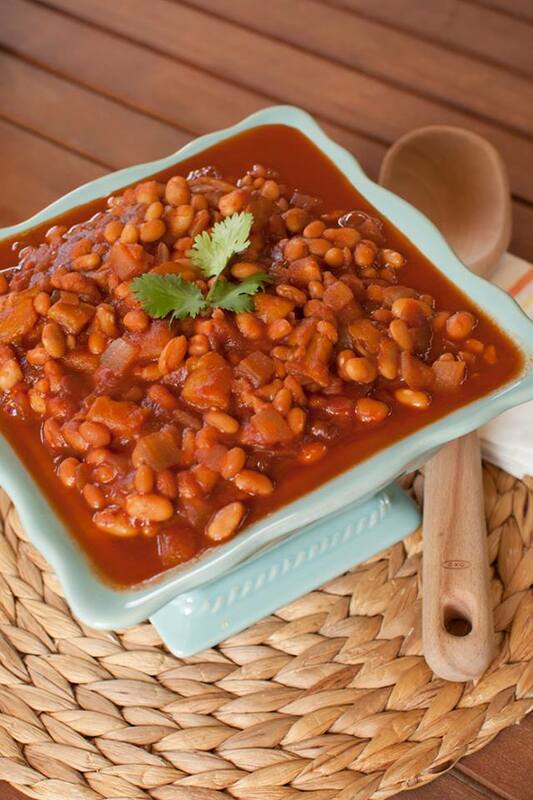 These vegan baked beans are the bee’s knees. Note: no bees were actually harmed in the making of these beans. They (the beans!) are tender and tangy; the perfect balance between sweet and savory. They’re kind of new and a little unique without being weird. They’re ideal for summer potluck BBQs because they work well for just about everyone there – a saucy side for the meat-eaters, but also substantial enough to fill in as a main dish for the plant-based peeps. Most of my barbecue sauce based recipes start with ketchup, but because I’ve moved more toward using non-refined ingredients, I decided to challenge myself with leaving it out. So instead, I started with tomato sauce, then added the flavors that you’d find in ketchup, along with a few ingredients and spices that transform the saucy base into barbecue saucy goodness. Then the beans stew in that saucy sauce along with chopped onion, garlic, and fresh mango. Saucy! I really like that word. 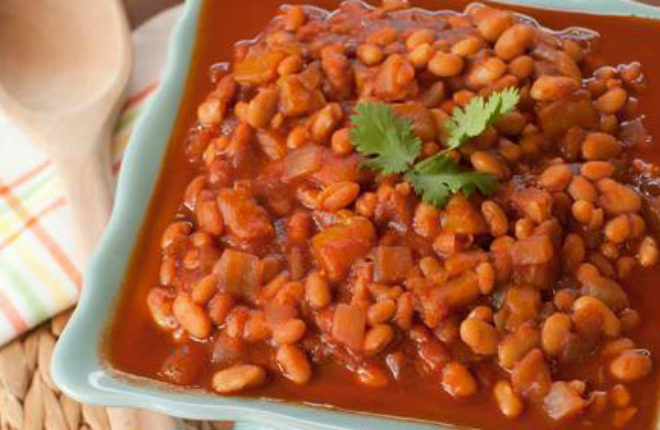 Oh, hello, savory-sweet, finger-licking BBQ beans. Okay! Off to watch my very last episode of Fixer Upper! When does Season 3 come out again?! Add all ingredients to slow cooker. Stir gently until combined. Cook on low for 8-10 hours or high for 5-6 hours. Taste and add additional salt if desired. Serve. Your recipe sounds very intriguing. I’ve been on a big mango kick lately…definitely want to try this!